about 7 years after the release and i am still in awe at how magnificent this album is. i think everyone who gives this album a listen will realize and imagine just how much time and effort was put into the making of these songs. her voice sounds so weary and vulnerable the lyrics are so strong, emotional, and powerful. Fiona Apple, quite possibly the greates singer/songwriter of our time, has made another beautiful piece of work. Her title inspires me so much, as does the music within it. She took a huge step as taking a new approach to her music. She decided for this album to not be as, dreary, as the other. I personally like both. This is very good. I'm a little surprised (pleasantly, of course) because this is so much better than the first album.I love the way the music sounds- all dark and melancholy. Oh, and Jackie or whatever your name is (first page) you spelt melancholy wrong. It's not spelt " mellan collie" Sorry. *no offense intended*. I don't know why on earth I haven't put attention to Fiona Apple before. I heard Criminal, Limp and Fast as you can and loved them but I never hadn't sit myself and listen to her. If you have ever changing moods, get this album NOW. How can I describe this album... I've had it for months and I still listen to it every day. It's without a doubt one of my top three albums of all time. The first song I heard was "Paper Bag", I was instantly swallowed in by the incredibly laissez faire mood of the song. So relaxing and fun to sway to. "Fast As You Can" (the album's first single), takes you through a fast, groovin' track ripe with emotion, then breaks into a down-toned interlude with the most beautiful vocal work I've ever heard before it pulls you back into its chaotic groove. "I Know" is relaxation in its purest form. This song suits any time of day, any mood, any weather. This song is for everyone. The piano just washes away every care and worry. 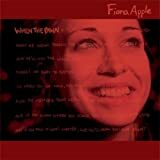 I've been listening to Fiona Apple for a long time now, and I figure it's only right that I come to Amazon.com and write a babbling review for this record. I've nothing interesting to say about the record, which is why I'm writing this review. It's great, but if you're new to her material and wondering whether Fiona Apple is typical mtv stuff, or more quality; she's more quality. A hermit that sits at home all day, drinking, and passing the time by submersing different fisher-price electronic toys in water just to hear what dying sound each one emitts would probably enjoy this record much more then your average Mike Johnson poogily bear, cook-out loving basketball playing skin-head weasle. See what I'm saying? ^ Therefore it must be brilliant. Fiona Apple returns in rare form in "When the Pawn..." (plus about ninety more words), her sophomore album -- and one of the rare ones that actually improves on the first. Her passionate bluesy-jazzy sound is blended with her strong, sensitive vocals and one soul-baring song after another. "Hell don't know my fury." You said it, Fiona. Anger and melancholy permeate her songs, including the rage of "Limp" ("But no matter what I try/You'll beat me with your bitter lies") and the restrained quality of piano-bombast "The Way Things Are." Even the musically gentle "I Know" has a deep sadness, starting to move past some of the bitterness and anger coming before it, and early on Apple seems to apologize for her romantic shortcomings. Female singer-songwriters are a dime a dozen today, but few of them do much more than set basic pop songs to acoustic guitar and piano. But Fiona Apple forges ahead with a noncomformist attitude and strong songs. In a nutshell, she comes across as an excellent musician, with all the power you'd expect from such a singer. And every song is a winner, gut-wrenching and beautiful in its intensity. Musically, it has almost as much impact as her writing does. The music is often led by Apple's piano -- not tinkly piano, but dark, fast melodies that match her songs in rhythm and intensity. Percussion booms in songs like "Limp," as if giving vent to Apple's feelings. And cropping up from time to time are odd gurgles and squiggles, as well as some well-blended horn arrangements in the background. Apple's voice is strong and assured, but it also has that rare quality of expressing vast amounts of emotion. Without, I might add, sounding overwrought. Which, since the mood is that of an Angry Young Woman, is a hard thing to pull off, but Apple's richly poetic lyrics ("And you can use my skin/to bury secrets in") make her songs seem intensely personal. The full title of this album is: When The Pawn Hits The Conflicts He Thinks Like A King What He Knows Throws The Blows When He Goes To The Fight And He'll Win The Whole Thing `Fore He Enters The Ring There's No Body To Batter When Your Mind Is Your Might So When You Go Solo, You Hold Your Own Hand And Remember That Depth Is The Greatest Of Heights And If You Know Where You Stand, Then You Know Where To Land And If You Fall It Won't Matter, Cuz You'll Know That You're Right. The songs contained on the album however are in fact, as ambitious as the title. When the Pawn more than fulfills the promises made on Tidal: The promises of an adventurous female musician for what was then the coming millenium who would exceed every expectation. The lyrics to "On the Bound" are a little difficult to follow at first. They're difficult to comprehend at second. But to Apple they must mean something for she sings them with great conviction and they fit seamlessly with the music. Lying limp in your own hand"
Listening to the track, the image of lips curled into a sneer of absolute derision and scorn is more than clearly visible. It's a creative song though above all, and doesn't retread old ground. Example: "You fondle my trigger, then you blame my gun." No one has said it better and I don't think anyone will surpass Apple for succinctness in this department. No, not "baby" anymore... "Love Ridden" is absolutely a perfectly crafted song. "Fast As You Can" is the album's single. It's a decision that I suppose was justifiable, although, I would've picked "Paper Bag". "Fast As You Can" opens like "On the Bound" with a short, interesting, ethnically-influenced drum solo that continues through the song layered with an almost "dance" beat. It's inventive, it's new - but it's very accesible. On the chorus, Apple makes skillful use of double-tracking, again acheiving an erie effect with an overused technique. The lyrics are remarkable when compared to those of other artists, but not in regards to the rest of the album. And the rest of the album? The rest of the album is great. Unlike Tidal, the end of this masterpiece doesn't flag in the slightest. "The Way Things Are" manages to be anthemic, in an odd way, and "Get Gone" is a perfect illustration of why Apple wears the crown of Angriest Chick of the Nineties ("It's time the truth was out that he don't give a / ---- about me") and "I Know" wraps the album up in a calm blusy manner This album gets a solid five out of five. Five Journals of Angsty Feministic Lyrics. In fact, It is so great, I have to buy another copy.. I wore the last one out. If you like Music at all.. you will like this. It is a bit heavy, though. Along with Tori Amos, Fiona Apple repopularised the piano as a rock instrument in the 1990s amidst a stream of annoying grunge and techno. Influenced by long-forgotten 1970s albums like Turn of the Cards, Tori's first two albums were exceptionally personal and melodic works that for me as a first- and second-year student of Melbourne University, became beacons of hope in a musical landscape that seemed to be deteriorating all the time. When she first emerged in 1996 with Tidal, I thought (oddly) Fiona Apple was from my native Australia and she seemed interesting enough that I bought "When The Pawn" almost as soon as it came out despite not being pleased with the new direction she seemed to be taking. With hindsight, I feel at present that my judgement has been vindicated. Just as Tori tried some quite silly experiments on her third album, on "When the Pawn" Apple is trying to be a "twisted" rocker. In the process, both her voice and piano lose out. What is undoubtedly meant to be eerie soundscapes on most tracks on "When the Pawn" tend to come off as half-hearted, notably on the opening two tracks. In other parts of the album, Apple simply comes off as tuneless. With the exception of "Fast As You Can", which really does pull off the trick of being utterly creepy, none of "When The Pawn"'s songs have a really memorable line or lyric: instead, they sound like Alanis Morrisette trying to be an art-rock singer. The lyrics, too, tend to be too much of the angsty, Melissa Etheridge-style "wronged lover" school to really be effective: there is not nearly enough personal reflection or serious storytelling. I heard Ms. Fiona perform on a morning news show and was quite taken with her performance. I proceded to purchase her newest cd, and loved it, so I decided to see what other cd's she had out there and this was one of them so I bought this as well. I was definitely also pleased with this one. I like her voice, sort of raspy and the words she sings are very distinguishable, the music does not drown her out but joins with her voice as one. There aren't many female solo artists I really like but Fiona Apple is one of them. "And I'll be your girl if you say it's a gift..."
Disclaimer: I heard this one after Apple's 3rd, and latest, album - so, loving the cabaret touches added to Extraordinary Machine (and sharper songwriting), I was a bit let down by When The Pawn. The formula is firmly in place, and it's a good one - PlasticOno piano, bitter recriminations, unpredictable metaphors, walloping beats, spooky Chamberlain and retro colors (usually on the coda). It's an intoxicating sound. "On The Bound" offers classic aggressive Apple and "Get Gone" gets downright nasty, but my fave is "Paper Bag," with its vulnerable stance and super-startling hook, "Hunger hurts but starving works when it costs too much to love." Her influence throughout pop music since the mid-90's is leviathan. This album seemed to get lost among the shuffle surrounding it and maybe no one actually popped it into their stereo and gave it a good, thorough listen. If this album is any indication of what's to (hopefully) come when Extraordinary Machine is released, and Sony Music gets over themselves, I'll pre-order a copy this instant. Better than her 1st album, if that's possible. She is in constant development in both lyricist and arranger abilities. All songs are great, and Fiona defined the feeling of the late 90s. On the Bound is a sensational song, with extreme power and depth. The production is high level, and her voice delivers exactly what we expect from the mood of the song. She is a true artist, label that is given so easily by the media these days, to the so called "talents". But not with Fiona, she deserves all acclamation that she got, and much more.